Although I had met Chef Charlie Palmer on several occasions throughout the years, we had never spoken at length. I had the opportunity to get to know the interesting man behind the chef coat when I attended his Oyster Social to support the New York City-based charity, Citymeals-on-Wheels. A master chef and restaurateur, you have created 13 Restaurants, written 4 cookbooks, appear regularly on television, and have received countless awards, where do you find inspiration for creating new restaurants and recipes? Everywhere, I travel daily from one city to another across the US, so it could be from passing by food trucks, strolling through the green market, aromas from other restaurants, or dinner at a friend's house. 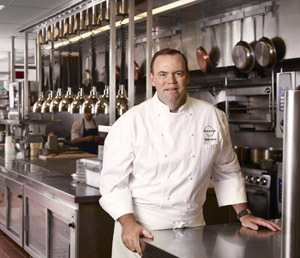 As a chef, who has most influenced and inspired you throughout your career? What advice would you give to someone who is thinking about pursuing a culinary career? Throughout my career, I have always tried to hire the best people, those with proven skills, a passion for cooking, and very hard working. Given that, I have had great success with graduates from my alma mater, The Culinary Institute of America. While there are always exceptions, in this day and age, I'd say that a formal culinary education is necessary. When not working in the kitchen, what are your other passions? Hunting, winemaking, and watching the New York Giants. I plan to continue to grow our boutique hotel portfolio. I really like getting involved in parts of hospitality and this is a natural fit considering how much time I spend at hotels with all my travels. How did you become involved with Citymeals-On-Wheels? I joined the Citymeals-on-Wheels Board of Directors almost twenty years ago, in July of 1994. Gael Greene, the founder of Citymeals, who is my good friend, did a wonderful job in starting a charity in which all public donations go directly towards the preparation and delivery of the meals to those in need. I respect how productive this organization is run. 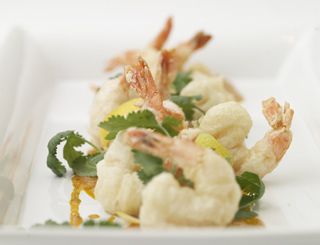 Chef Charlie Palmer graciously shares a delicious taste of his culinary style with recipes for Oysters on the Half-Shell with Green Apple-Cucumber Dressing, and Shrimp Tempura + Sweet Chili Dipping Sauce. Bon Appétit! From "Charlie Palmer's Practical Guide to the New American Kitchen"
Apple-Cucumber Dressing Method: Whisk together the mirin, vinegar, oil, and shallot in a medium bowl. Julienne the apple and cucumber, then dice them fine. Immediately drop them into the mirin mixture (the acid in the wine will keep the apple from turning brown). 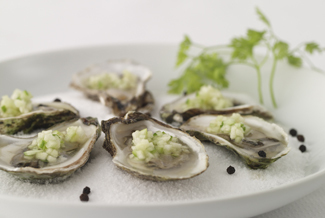 Oysters Method: This can be done several hours before serving, but oysters are best when freshest. It is preferable to make the dressing, assemble the serving plates, and open the oysters at the last minute. Get out a sheet pan. Take a piece of aluminum foil twice the length of the pan and crinkle it up to fit the pan to create a contoured bed for the opened oysters: You want them to stay level so the liquor doesn't tip out of the shells. Open the oysters and nestle them into the foil. Cover loosely with plastic wrap and refrigerate. To Serve: On each appetizer plate, form a mound of salt or crushed ice, then flatten it slightly. If using salt, scatter a few of the whole spices over it for looks. Spoon the dressing over the oysters while they are still on the pan, then carefully transfer them to the plates, arranging 6 oysters on each. Serve with cocktail forks. Note: Serving oysters on a bed of rock salt, crushed ice and/or seaweed keeps them level so they don't lose an of their liquid or dressing. Sauce Method: Heat the oil in a medium saucepan over medium heat. Add the scallions, lemon grass, shallots, and ginger, and sweat them with a pinch of salt for 5 minutes. Add the citrus juices, bring to a simmer, and cook until the liquid has reduced by half. Add the chili sauce and simmer for 15 minutes longer. Remove the pan from the heat and drop in the cilantro, which will wilt instantly. Puree the sauce with a hand blender, then set aside to cool. Shrimp Method: Heat the oil to 350°F in a large, deep, straight-sided pot. Flick a little batter into the pot to test the oil temperature: the batter should sink halfway and then pop back to the surface. Using the tail as a handle, dip the shrimp into the batter just up to the tail. Swish them around a little to coat them evenly and completely, then shake off any excess batter. Dip the shrimp halfway into the oil and hold for 4 seconds, or until the batter puffs up, before slipping them into the oil. Gently roll the shrimp around with a wire-mesh skimmer, cooking 3 to 4 minutes or until golden brown; remove them as soon as they are done. Drain the shrimp on a paper towel-lined platter. Aureole serves Lunch Monday through Friday from 11:45 am until 2:15 pm, and Dinner Monday through Sunday from 5:00 pm until 10:00 pm. Read about Aureole in the Restaurants section. © October 2012. Luxury Experience. www.LuxuryExperience.com. All rights reserved.